The ancient capital of the world with its glory bubbling over the face of monuments, stroll the Imperial Forums and merge inside the traffic jams around the Colosseum! The incredible urban scenario in Rome encourages you to stay outside. Don’t you feel like going to a museum? Then let’s visit the undergrounds of the lost empire! 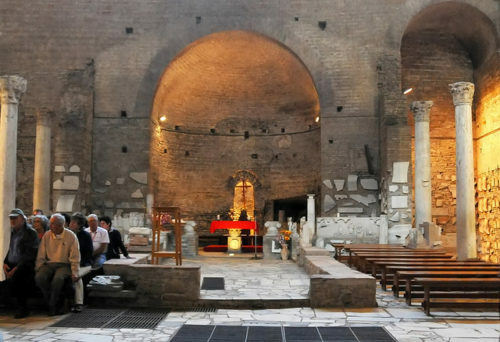 Here we go for a magical, mystery tour inside Rome and the underground burial chambers. The catacombs are famous burial places in Rome. Mazes of tunnels, examples of early Christian art and thousands of bodies!!! Why? Burials were forbidden inside the walls of Rome. Then miles and miles of tunnels were cut into the tufa stone and used as burial chambers. Rome’s Via Appia Antica is in fact outside the walls of Rome and it was a burial place for early Christians as well as for pagans. A guided tour lasting 20 minutes to an hour will bring you in the intestines of Rome. The Catacombs of St. Callixtus (Catacombe di San Callisto) has the longest network of galleries in the capital. About 19 km long and 20 meters deep, here you will find the crypt of nine popes and early Christian frescoes, paintings, and sculptures. The Catacombs of St. Sebastian (Catacombe di San Sebastiano) has about 11 km of tunnels but the tour includes a very small area. Here there are early Christian mosaics and graffiti. Catacombs of St. Domitilla (Catacombe di San Domitilla) are the oldest catacombs in Rome. The entrance is inside a fourth century church. Interesting to visit here is a second century fresco representing the Last Supper. St. Priscilla’s Catacombs (Catacombe di Priscilla) are from the late second century AD and for this reason among Rome’s oldest catacombs. This entry was posted on Saturday, September 22nd, 2012 at 6:52 pm	and is filed under Discover Italy. You can follow any responses to this entry through the RSS 2.0 feed. You can leave a response, or trackback from your own site.